Oh yes! The appliance fairy has been seen flitting about the blogosphere recently granting all sorts of wishes, and now I've been lucky enough to get a visit! After commenting on Helen's post at Fuss Free Flavours, I received an email from the Fairy Hobmother granting my wish, which was for a hand held electric mixer as mine was broken, and here it is! Just in case you were wondering, I can reveal that the fairy can also be found at Appliances Online, who sell cookers and all kinds of other white goods. The Fairy Hobmother could visit you too! As well as Helen who received a mixer, I have also seen granted wishes at Kavey Eats (pasta attachment) and Single Dad (washing machine). Your wishes don't have to be things that Appliances Online sell, they could be an appliance like my mixer! Just leave a comment telling me what you would like and why, and your wish could be granted. If you are a tweeter, you can also tweet your wish, you must include these three twitter ID's in your tweet @cherrapeno @AppOnline @Ian_Goodall. And here's the dessert made with my new toy. Adapted from Sainsbury's Cream Cakes & Gateaux. Pre-heat the oven to 180ºC (350ºF). Cream the butter and half the sugar together until light and fluffy. Beat in the egg yolks. Sift the flour, baking powder, salt and cocoa together and stir into the creamed mixture with the milk. Mix thoroughly and spread thinly in a 20 x 30 cm (8" x 12") Swiss roll tin that has been lined with non-stick baking parchment. 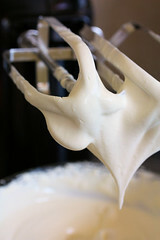 Whisk the egg whites until stiff, then gradually whisk in the remaining sugar. 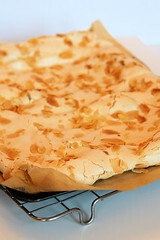 Spread this meringue over the cake mixture and sprinkle with the almonds. Bake for about 20 minutes. Leave in the tin to cool. Carefully remove from the tin and cut in half lengthways. I found it easier to cut right through the baking parchment. Take one half and turn it over onto a serving plate, the meringue should be on the bottom of the plate. Peel off the paper and spread with the whipped double cream. Top with the remaining cake. This can be a bit tricky, I turned the cake over onto another piece of parchment and peeled off the paper. Then I lifted it up and quickly turned it back over, placing it onto the cream layer. The meringue should be on top. Drizzle the melted chocolate over the top of the meringue and serve. With thanks to Ian at Appliances Online. Ooooh to be in England, now that Spring and the Fairy Hobmother are there!! That's a neat electric mixer...and would be definitely on my wishlist. 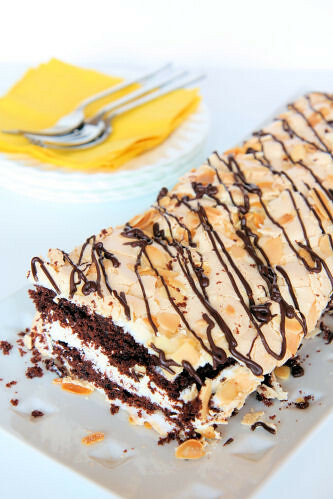 Love the meringue layer cake you made with it. Gorgeous! and that is the mixer that won the great live radio mixer off too! Well your dessert is amazing Nic. I wish that I could just take my fork and I'd relish every nibble.What do I really need in my kitchen? A Cuisinart Ice Cream Maker!!!! What a great use for your new toy! If the fairy hobmother granted my wish, it would be for an immersion blender as I burnt the motor out in mine making a particularly tricky soup! Ooohhh....bread maker for sure! I'm always so envious of the perfectly delicious loaves of bread I see on all the other food blogs. Totally green. Your new toy looks like lots of fun and I can't wait to see what other tasty treats you rock out with that bad boy! Great looking cake and I bet is tasted fantastic - this has got to go on my list. Love the idea of a Fairy Hobmother. I need a new grinder for tough things like nuts, dandelion roots, spices etc as our current one is looking more than a little the worse for wear. you made with it. It looks sinful! I've tweeted and now I am back to look at the slice again, wondering if I have all the ingredients and if I have time to make that as well as the cake for my mum for mother's day. If I actually thought for a moment the Fairy Hobmother would grant my wish I'd actually opt for a Dehydrator. Dried fruit is so pricey but when you can't eat processed sugar it's the nearest thing there is to a sweet treat. I'd love to try drying my own exotic fruit like mango, pineapple and watermelon. What a wonderful tasty looking cake. How fabulous for you to receive goodies from the company. That would be incredible. I'll look into seeing if I can track down the website and play along! The meringue cake looks fabulous! Its a real stunner! I would love the Fairy Hobmother to bring me a new Panasonic Breadmaker, so that I don't have to keep running back to it, to add extra ingredients! Since we're nearing the Summer, I really wish the fairy Hobmother would bring me an Ice Cream Maker (Cuisinart) would be just the very thing! 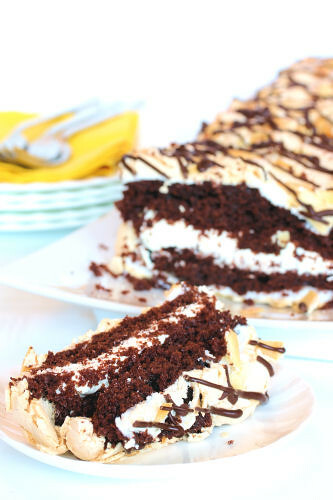 OMG The chocolate meringue cake looks divine! I would love it if the Fairy Hobmother brought me an ice cream maker! The Choc meringue looks amazing! I'd love a professional ice cream maker, one of those you don't need to freeze in advance as I've never found them any good. I'm longing to try making my own cinnamon or hazelnut ice cream, especially now the warmer weather is coming. Oh that electric mixer is fantastic i need one of those! and slice of cake, i'm sold out Divine! What a special cake. Lovely and light looking. I'm due to be moving home and would like a number of white appliances, but its too early to ask for them. What I do know for sure though is that I'd love a food dehydrator. That is one nice mixer! And one great cake. Nic - apologies for not letting you know before, I thought I had. But I did get my wish granted (of sorts), so thank you. A bit late in the day now, but I've just posted about mine. That mixer looks gorgeous. 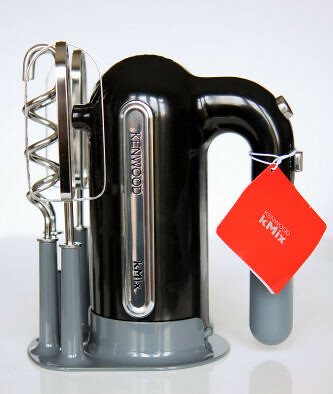 I do love a bit of kMix. I'm in desperate want for one of those quick boil kettles. We still have out £9 we bought from Tesco when we moved into our first house!